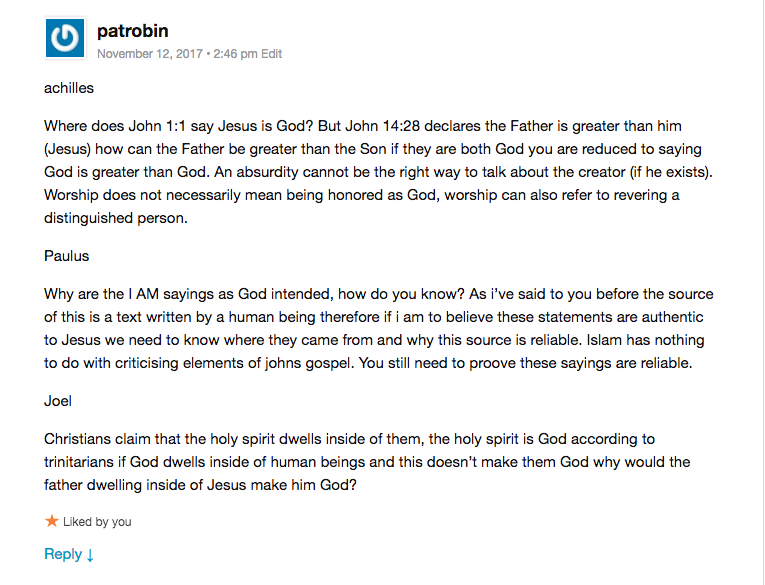 In the Jesus said… post below patrobin makes some very astute points and asks three very good questions. So good in fact that I want to make a separate post for them. Enjoy..
Where does jesus say the father “dwells” inside of him? The clear reading is that he and the father are of the same essence. Clearly, christians saying the holy spirit indwells is different to jesus claiming to be of divine essence. You have made a category error. I was also hoping that you address the point I made to Paulus – which NT/jesus scholar looks to the quran as a source to investigate the historical jesus? My sense is that there absolutely none who take the quran seriously when it comes to the historical jesus. The Quran is the literal speech of God. Western historians a priori rule out the testimony of God. They only accept the testimony of fallible men. Everyone knows that. Then why is the quran reliant on man made traditions to explain this “word of god”? Why isn’t the quran self-explanatory? The Quran itself points us to God’s final prophet sent to all of mankind by God Himself to explain, teach and to instruct with wisdom the Quran. For example, how much to pay in Zakat (its 2.5%), exactly how to pray, details of fasting, and so on. From the beginning it was always the Quran and sunnah together. Muslims have never been Quran only people. In other words, the quran is incomplete without mohammed? That’s as shirky as it gets. Allah’s word is incomplete without flawed, sinful, maimer, mohammed. You’ve admitted it. Islam contradicts the quran – the quran claims to be clear and complete, muslims claim that it is incomplete without mohammed. Why are the two things different? Jesus was a human being who claimed God was inside of him, christians claim that God is inside of them. Why should I consider it a category error. The reason why i didn’t address the point from Paulus is because it is irrelevant to the point we are all discussing. The reason why i put a post from the Qur’an was to demonstrate the harmony between Islam and Christianity on what was a fundamental teaching of Jesus in that respect the teaching of the Qur’an reiterates what has come before. That should be taken seriously regardless whether you are a scholar or not. Finally i struggle to understand why you think Jesus and the father are of the same essence when Jesus is according to trinitarians to be both divine and human, the father is not human at all. Perhaps prior to the incarnation a trinitarian could say they were of one essence but since the nature of God the son has changed how can this be considered to still be the case? It seems pretty straight forward to me. When christians say the HS “dwells” in them, we understand that to mean something not of our essence is within us. Jesus comes nowhere near to saying that. He clearly claims that the father is intrinsic to him and that he intrinsic to the father – jesus says that he is in the father also. Did you miss that part? So as simply as I can say it – jesus claims to be in the father and the father is in him. Christians don’t claim to be in the HS or the father, although the HS can indwell humans. even the OT affirms the prophets being filled with the spirit. In fact, mohammed calls on the spirit of allah to help a follower of his. Either way, if you agree that jesus claimed that god was in him, then you deny islam. Good for you! that the quran is a credible source for the study of the historical jesus? Again, jesus claims to be in the father – only the divine can be in the divine. I’m not seeing why this seems to be so complicated for you to understand? The text is pretty straightforward and clear. Jesus is in the father and the father is in jesus. Damn i’m confused bro haha 😅…okay if we are “in Jesus and the Father” does that make us divine? It’s not a genuine question. You are trying to apply historical criticism to the I Am statements (fine) but refuse to do the same with Isa’s statements in the Koran. As I already told you, appealing to the Koran being the word of God does not resolve this since Christian believe the GJohn is the word of God. Nowhere does John claim to be the word of God so i don’t know why anyone else should. Whereas the Quran claims many times to be the word of God hence why asking for an isaad is rather odd. The word of god can be corrupted – muslims make this very claim. Your argument does not suffice – you still need a chain of evidences or isnaad to support your claim. Otherwise you are merely making a circular argument, which seems to be common for apologists for islam. If you are going down this road, you have to prove that the quran is not corrupted. You can’t. My claim was never that the Qur’an is the word of God, if i believed that i would be a Muslim however my argument is only that we can’t evaluate the Qur’anic sayings of Jesus and I AM sayings using the same criteria because they are not claiming the same thing. I agree with you that these sayings need to be validated beyond a claim of divine authority but my point is still that Gospel of John does not claim divine authority, rather it claims to be the testimony of the disciple whom Jesus loved in that respect the chain goes back to Jesus but through this disciple whereas every statement in the Qur’an claims to come from God and thus a chain of transmission is uneccesary because God is all knowing so doesn’t need a chain of people. That is the fallacy of special pleading. If the quran claims that the historical jesus made statements – and it does – then the quran is making a historical claim. As such, the quran is subject to the same standard of historical investigation as the NT. Furthermore, the quran is an eyewitness account – it is an eyewitnesses/scribes writing down what mohammed is supposed to have said an angel said to him. The quran by necessity are the words of mohammed written down by witnesses who heard him preach. No other human being living at the time ever saw an angel speaking the words that supposedly became the quran, so there are no witnesses to verify mohammed’s claims, Thus, the quran is mohammed’s words, and it is mohammed who claimed that it is divine word. So a chain of transmission is very much necessary – who wrote down these words that they heard from mohammed. When did they write it down? Was it written down in the moment, or was it written down from memory decades after the fact? Mohammed could not read, so how do we know that the men who wrote the quran were honest about what they wrote down? How do we know that they did not embellish what they had heard? Did these men write down what other men had heard mohammed say was revealed to him? Who did they hear it from, if not mohammed? Muslims cannot answer any of these questions. If one only has a beginning knowledge of Greek, it is very dangerous. The grammar and Greek syntax of John 1:1 determines the right theology. The doctrine of the Deity of Christ and the eternality of the Son is based on Scripture, not the Council of Nicaea. The Council of Nicaea is based on Scripture, and derives secondary authority from the only infallible authority – the Scriptures. The predicate nominative issue is the key interpretive issue, more important than the definite article issue. 2) why does it lack the article? In brief, its emphatic position stresses its essence or quality: “What God was, the Word was” is how one translation brings out this force. Its lack of a definite article keeps us from identifying the person of the Word ( Jesus Christ) with the person of “God” (the Father). That is to say, the word order tells us that Jesus Christ has all the divine attributes that the Father has; lack of the article tells us that Jesus Christ is not the Father. John’s wording here is beautifully compact! It is, in fact, one of the most elegantly terse theological statements one could ever find. As Martin Luther said, the lack of an article is against Sabellianism [Modalism]; the word order is against Arianism. Several years ago, (2012) even Paul Williams admitted that the traditional understanding of John 1:1 was the correct one – that it taught the Deity of Christ. “I am the bread of life” John 6:35 = spiritual nourishment, spiritual sustenance. I am the Good Shepherd – John 10:10-11 – a claim to be the Yahweh of Psalm 23 – the only one who can truly guide and feed and take care of us, His people, His flock. I am” – John 8:24 – clear verse that one must believe in the Deity of Christ to be saved. So powerful the guards fell back and down. the problem is the historical Jesus probably did not say these words. So says a majority of evangelical scholars! actually, Jesus did say them all, so says God through the Holy Scriptures, who inspired the Scriptures – “all Scritpure is God-breathed” – 2 Timothy 3:16. Jesus promised the Holy Spirit would lead the apostles into all the truth (John 14:26; 16:12-13) and bring to their remembrance everything He taught them; and they wrote everything down that is necessary for salvation, like, and godliness. Jesus promised the Holy Spirit would lead the apostles into all the truth (John 14:26; 16:12-13) and bring to their remembrance everything He taught them; and they wrote everything down that is necessary for salvation, life, and godliness. The Holy Spirit dwells inside = there is a spiritual connection in believers between their heart/soul and the Holy Spirit – it does not mean something physical – like water inside of a glass – it is a spiritual metaphor for connection, relationship, fellowship – that unbelievers do not have with the Triune God.